With Obama-McCain fever in full swing in America, those of you back home may have missed out on the fact that New Zealand (along with Canada (Oct), Great Britain, and Australia) is about to hold its own national elections. Don’t feel too bad though. A news report we saw last night claimed that even a majority of Kiwis are more interested in the US elections than the on-going race in the EnZed. We also saw a report the other day featuring a Kiwi woman who was volunteering for Obama’s campaign, despite the fact that she is unable to vote in the US election. This brings new meaning to my “work exchange” visa, since I have been spending my time volunteering for the Green Party here. At first the NZ election is frighteningly similar to it US counterpart. There are two major parties, a blue and red. Although here red stands for the Labour Party (Democrats) and blue for National (Republicans). The incumbant, Labour’s Helen Clark, an older white established politician, is fighting to stay in power against a younger, vibrant John Key. Same old story. But, although this is the major story of the elections, the New Zealand political system offers more to its voters. There are about 6 minor parties that play a significant role in the election. Voters get to vote for individuals for their local MP’s, which makes up about half of the parliament. But, instead of voting for an individual for prime minister, voters cast their ballot for a party in the national election. The party with the largest percentage of party votes gets their leader as Prime Minister, and each party gets a number of MP’s proportional to the percentage of votes they draw. The minor parties range from Christian, to libertarian, to the greens, to the Maori party. 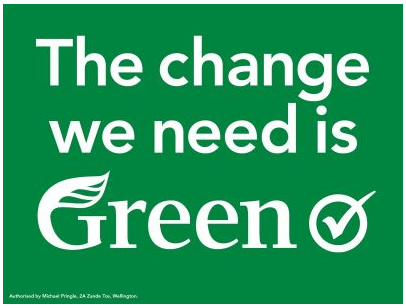 It feels good to support the Green Party here. Aside from their eye-catching ads they are contributing a strong positive voice to this campaign. The Greens are only hoping to draw a max of 10% of the votes this election. But, compared to the combined .5% that Nader (dem.) and Cobb (green) earned in the 2004 US election, 10% sounds pretty impressive. It will put them, along with other minor party MP’s, in a powerful position in the new parliament, and through coalition-building they are seen as a deciding factor in many key issues. No matter who you are Multi-party = More voices & More power in your vote. Come on America get with it.